What's New at The Top? Just in time for the holidays, we’re bringing back our throwback T-shirts available for a short time only through local screen-printing company Inked and Screened! 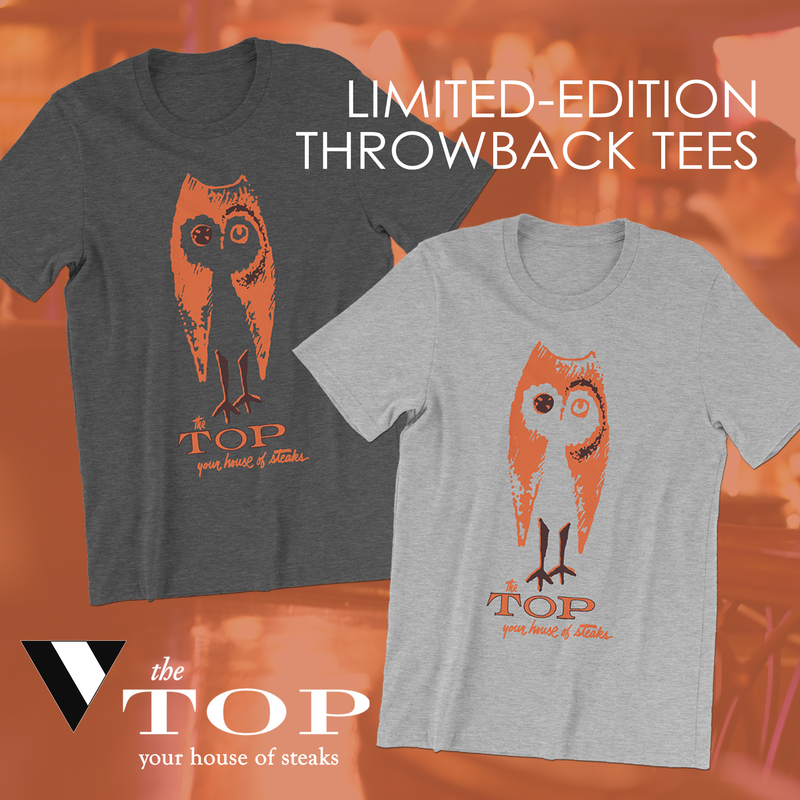 Show your love for The Top with one of our retro tees featuring an owl illustration pulled from our classic menu. The Top Steakhouse’s original owners Lee Henry and Bill Sapp commissioned local artist Roger Williams to design the supper club menu. The playful illustrations depict steaks, cocktails, lobsters and other steakhouse fare. The owl serves as a mascot of sorts for the Night Owl sandwich, an open-faced filet sandwich that used to be available to order only after 9 p.m. These days, the sandwich is served anytime. The shirts are priced starting at $25 and available in charcoal gray (50% cotton, 50% polyester soft blend) and heather gray (90% cotton, 10% polyester blend). T-shirts must be ordered before midnight on December 12 as part of the initial pre-sale, and will be printed and shipped by December 18 for delivery before Christmas. Order yours online today at Inked and Screened.